For a more detailed description of our fragmented languages scale, click here. Wappo is one of the better-documented indigenous languages of California, with two published grammars and a number of published and unpublished texts and recordings. However, this documentation and research has significant gaps. Apart from the early, not fully reliable grammar of Radin, most documentation comes from a single speaker. Linguistic research in Wappo has also been overwhelmingly focused on syntax, to the extent that very little has been written or published about Wappo phonology. Discussion of the linguistic context of Wappo has also not paid sufficient attention to areal influences and other non-genetic relations. 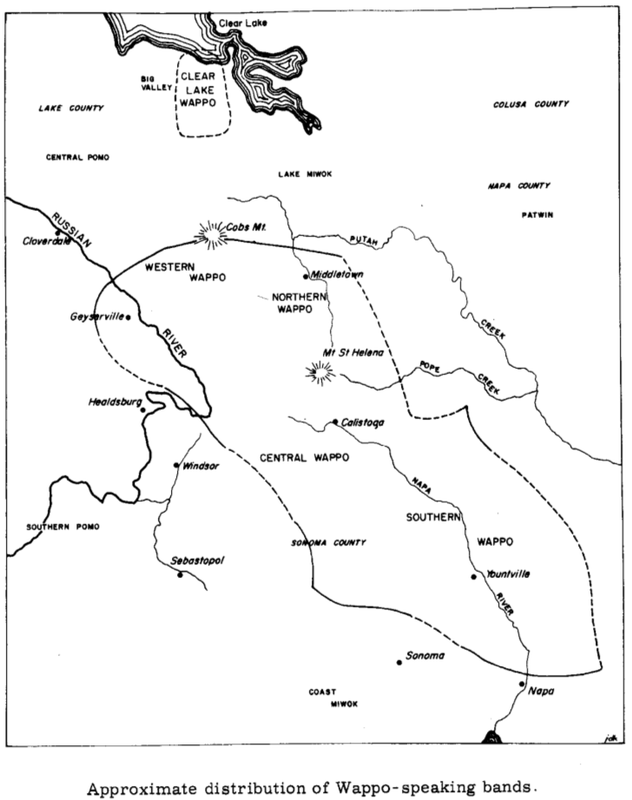 Wappo was traditionally spoken in territory in modern-day Sonoma and Napa counties, including parts of the Alexander Valley, the Russian River Valley and Napa Valley, as well as in a smaller territory at the southern shore of Clear Lake. Wappo may be distantly related to Yuki, which is spoken further to the west. This is the only genetic relationship for Wappo that is widely credited today. The languages spoken around Wappo, to which it is not related, include Southern and Central Pomo; Lake Miwok, Coast Miwok; and Patwin. The map below, from Sawyer’s English-Wappo Vocabulary (1965), provides more geographical detail. Wappo speakers were heavily impacted by missionization, Mexican occupation, and the gold rush and American settlement. A probable population of more than 1,000 around 1770 was reduced to under 100 by the beginning of the 20th century. (Since then the population has begun to grow again, although not yet attaining the pre-mission level.) These changes are reflected in substantial lexical borrowings into Wappo, mostly from Spanish. For example, hint̯il ‘Indian’ and layh ‘white person’ are borrowed from Spanish mission terms gentil and laico. The name Wappo is also borrowed from Spanish guapo ‘handsome, brave’. (However, this name is not used in Wappo as an autoethnonym.) There were reported to have been several distinct dialects of Wappo, although their differences and the relations between them are poorly understood. As late as the 1920s a “high speech” or literary register was documented by Radin, but the forms associated with this register were unfamiliar to later speakers.